Nagpur police turn Salman’s Bharat poster into a meme The Nagpur police shared the Salman Khan starrer ‘ Bharat‘ poster on their social media handles. The aim is to catch maximum eyeballs of online youth. The film will hit the theatres on June 5. Katrina Kaif Takes Training From Olympian Michael Phelps Watch Katrina Kaif getting fitness tips from US swimming star and Olympian Michael Phelps on his India visit. The actress has shared a video of herself in conversation with Olympics gold medallist Michael Phelps. Sunny Leone takes up HandcuffChallenge Handcuff challenge has surfaced on the Internet. Bollywood diva, Sunny Leone is seen happily cuffed to her husband, Daniel Weber. Check out the tasks associated with the challenge. Salman Khan in a Chinese TV Series Salman Khan is not only famous in India but all across the World. The actor became a motivational factor for an agency in China. The actor’s Bodyguard film photo turns inspirational for a Chinese TV series The Beautiful Bodyguards. Jr NTR gets huge remuneration for Big Boss 3! Adah Sharma 100 years challenge, Any Takers? 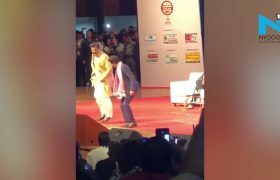 Shah Rukh Khan thumka on Bhojpuri number. Shah Rukh Khan has recently visited Patna to attend one of the events. 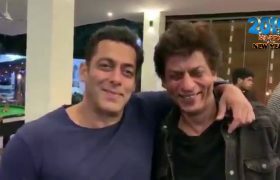 King Khan has danced with Bhojpuri actor Ravi Kishan. He has also performed a dance with youth and children on several songs.